Rugelach, meaning "rolled cookie," is a traditional Jewish recipe. It can be eaten any time of the year but is most popular around the holidays. Lots of variations exist, but the most common types involve a crescent shaped pastry dough filled with cinnamon sugar, dried fruit and nuts. This is a delicious treat to make for the holidays, and a welcome change from the usual heavy, chocolate laden goods (not that we're complaining)! 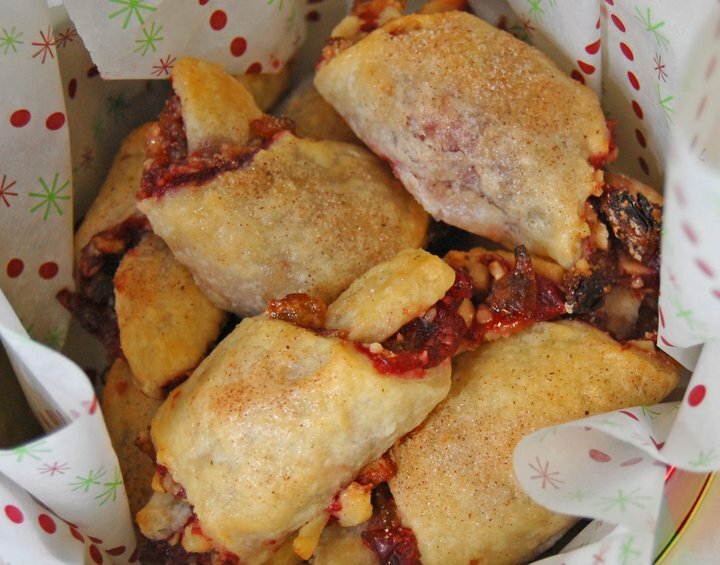 This recipe is derived from Ina Garten's Rugelach Recipe. The dough is made from very simple ingredients: butter, cream cheese, sugar, vanilla and flour. That I have kept the same. I've come up with my own twist on the filling. Hope you enjoy! Place the crescents onto a parchment-lined baking sheet and chill them for 30 minutes. Repeat the above process with the other 3 discs of pastry dough. 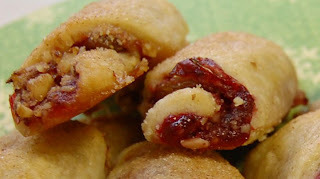 Once the rugelach have chilled, brush the tops with egg-wash and sprinkle with cinnamon-sugar. Then bake for about 20 minutes, until they are golden-brown. Rotate half-way through to ensure even browning. Remove from oven and allow to cool. Then enjoy! These keep for several days in an air-tight container. This recipe makes about 32 rugelach. Makes a beautiful and delicious party treat! Keep in mind there are a lot of possibilities with this recipe. You can use any combination of jam/preserves, dried fruit and nuts that you desire. I love the look and taste of golden raisins with cranberries...which is why I do it this way. Be creative! Merry Christmas! (Or perhaps Happy Hanukkah would be more appropriate here)!